Two Unique Assemblies Loved By Students, Teachers, Principals, and Parents! Students discover the importance of math by learning the essentials of personal finance. Watch the short preview video below. BONUS: A free downloadable copy of "6 Ways to Help Your Child Learn about Money" for each student's family. 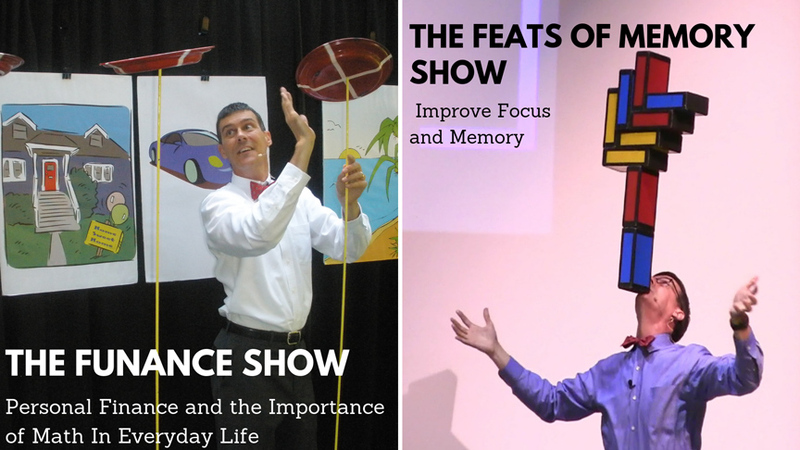 Watch the short video above of The FUNance Show to see how fun it can be to learn about math and personal finance. Watch the 60-second preview video below. Entertaining versions for grades 3 to 12 filled with feats of memory, comedy, storytelling and circus arts. BONUS: A free copy of Brad's book, Unlock Your Amazing Memory provided For each student, class or school - get a custom quote for more details. As a former Financial Planner and Accredited Asset Manager Specialist (College of Financial Planning), Brad (aka "Mr. Z.") is uniquely qualified to teach students about the importance of math and personal finance. He uses his 30 years of worldwide performing experience to entertain grades K-6 while helping them grasp abstract finance concepts like budgeting, saving, needs and wants and more. Students leave the assembly grasping concepts that many adults don't, with an ability to not only understand math and money, but know how they can get more of what they want, all without begging and pleading! Click here to visit the full FUNance For Kids page for details, reviews and more. Click here to visit the full Feats of Memory page for details, reviews and more. and determine if Either or both of these unique assemblies is a good fit for your school. Click here for the contact form or use the information below.